All my life I have making Punjabi Rajma Masala, recipe adopted from my mother's kitchen. When I discovered this recipe, I thought I might give this no onion-garlic recipe a try myself. Now I've been thinking of making this and telling my husband since past two months. And when the time finally came to prepare this wonderful delicacy, he totally rejected the idea of a no onion-garlic rajma masala. So I have added the same in my version, the original recipe calls for none. So it can be made both ways, with or without onion-garlic according to taste and occasion. We added to retain our Punjabi style rajma flavour, tasted very different from our regular recipe though. 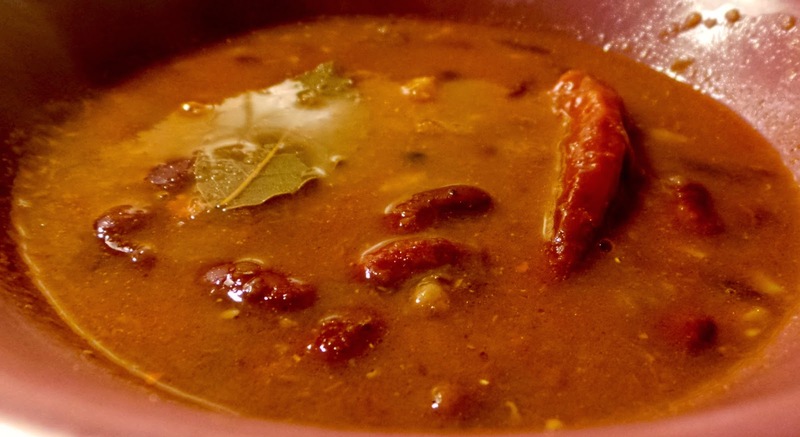 Soak rajma with enough water overnight or at least 8-10 hours. 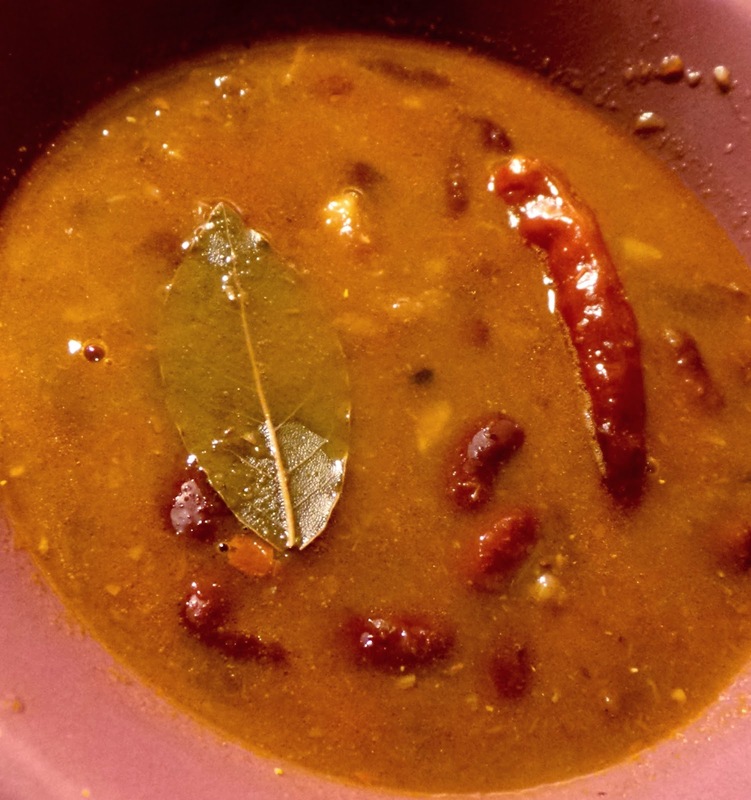 Discard the water, wash rajma well and boil with 5 cups water, little salt and the bay leaf for 5 whistles. Keep aside and let the pressure settle by itself. Open the pressure cooker, pick one rajma and check for doneness. If not done completely, it might need 2-3 whistles more, depending on the type of rajma and the type of pressure cooker. Make rajma masala: Add all the rajma masala ingredients in a mortal-pestel and grind to a coarse powder. Alternatively can be done in a mixer as well. Keep aside. Prepare tempering in a pan: Heat oil and splutter cumin seeds. Add asafoetida and dried red chilli and fry for half a minute. Add the grated ginger and mix well and let cook for a minute. If using onions and garlic, add them in mixer and grind to a smooth paste. This step is totally optional and skip this if you wish. The rajma will taste wonderful in any case. Add the onion-garlic paste to the pan (if using) and let it fry until the masala is totally cooked, the raw smell is gone and it starts leaving oil on the sides. Puree the tomatoes and add the tomatoes after ginger directly in case not using onion-garlic, or add when the onion-garlic masala is cooked. Add a bit of salt and let cook until the tomatoes are totally cooked. This will take about 10 minutes on medium flame. Do not skip this step as the masala will determine the entire flavour of the dish. Add red chilli powder and the prepared rajma powder. 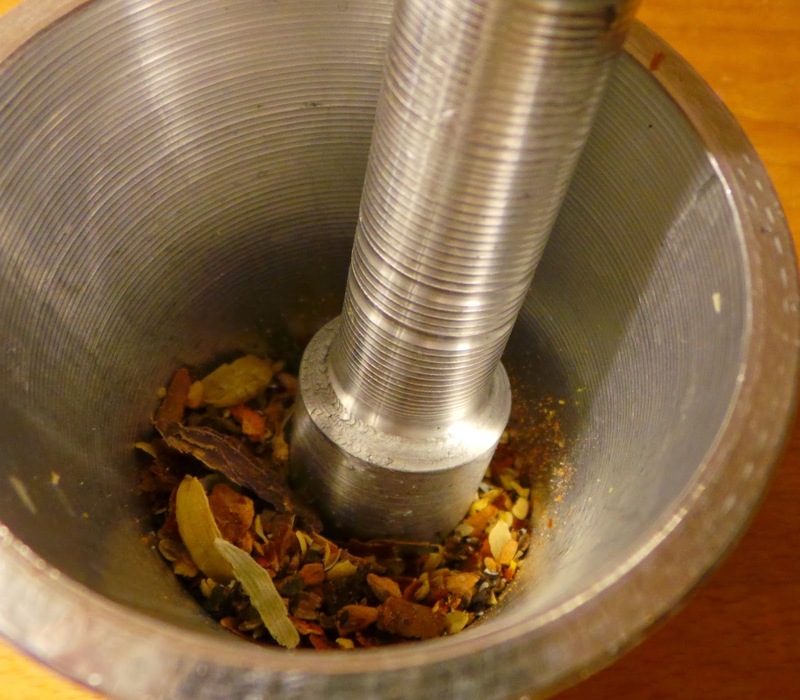 Mix well and let cook for at least 2 minutes to embed the spice flavour in the masala. Now using a perforated spoon, take out all the rajma from the pressure cooker and start adding to the masala, leaving the water in which rajma is boiled, behind. Mix well with the masala and start pressing some of the rajma beans in the masala with the help of a cooking spoon. Do not do this will all the beans, just some, and some will be split open. Mix really well with the masala and cook for 5 minutes on medium-high flame so the complete flavour gets incorporated in every bean. Now add this complete mixture to the water remaining in the pressure cooker and mix well. Add little more water if required. Ideally more water should not be added as it will dilute the flavours. But if the curry is too thick, add about half a cup of boiling water. Mix well and cook for 10 minutes on the highest flame. Remove from the flame, place the lid on top, do not tighten the lid. Remain covered for 10 minutes, remover cover, garnish with coriander leaves (optional) and serve piping hot with plain rice or jeera rice and lemon wedges.